Dr Tracy Mountford is a top UK cosmetic doctor with great expert insight into celebrity beauty through from the fresh-faced 20-something starlets to the glamorous red carpet veterans. She has observed lots of interesting trends throughout this awards season including a ‘celebrity shift’ away from surgery towards more subtle anti-ageing measures, and a growing desire to ‘press pause’ on ageing. Meaning we all (not just celebrities) want to look great for our age but not necessarily younger and of course that prevention is better than cure. If you would like to see an ‘on the sofa with’ style interview with Tracy discussing the best red carpet moments of the 2015 awards season so far, just click here. I like the sounds of this new trend! Towards the end of last year I discovered the CACI microlift which is a non surgical, at home system to tone your skin and reduce the appearance of wrinkles. You can see my introduction to CACI here. 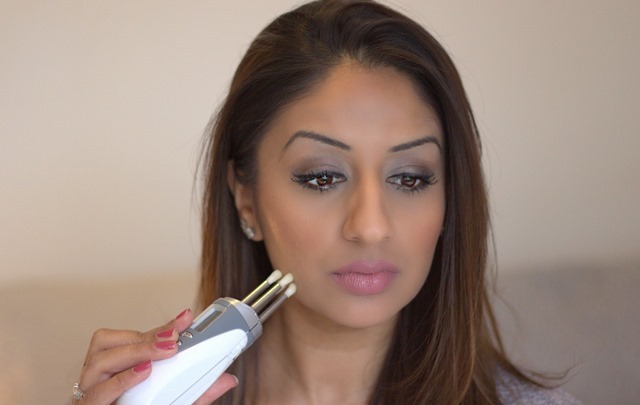 The CACI Microlift is actually to compliment CACI salon treatments, I went along to the gorgeous and fairly new beauty salon in Chiswick, Nubarose to try a salon treatment last week. I had the Super Caci Non Surgical Facelift which gives visible results after just one treatment. Working with your facial muscles the treatment is very similar to the microlift but the pulses are stronger (still no pain at all) and it lasts for an hour rather than ten minutes. Generally, other facials concentrate on going skin deep and are more about radiance and cleansing for the skin, this treatment works with the muscles in your face and neck. It’s like a facial workout but you can lay back and actually relax!